The Transport Department (TD) announced that New Territories green minibus (GMB) route No. 9A, which will ply between Pak Tam Chung and the East Dam of High Island Reservoir in Sai Kung, will be introduced on July 22 (Sunday). The route will operate from 3pm to 6pm on Sundays and public holidays at a frequency of 20 to 25 minutes and the fare will be $11.30. The route will operate on a trial basis and will be reviewed after three months of operation. The East Dam of High Island Reservoir is located within the Hong Kong UNESCO Global Geopark, which has been a popular tourist attraction for both local and overseas visitors. The TD believes that the above GMB service will assist them to visit the High Island Reservoir on Sundays and public holidays. The TD will closely monitor the passenger demand of the above GMB service, and will suitably adjust the service if necessary. Hong Kong UNESCO Global Geopark has been working with various geopark communities, non-governmental organizations and other stakeholders to promote natural conservation and conduct innovative rural area management. In Lai Chi Wo, it launched a Chief Executive’s Community Project, named “Lai Chi Wo Hakka Life”, the “Sustainable Lai Chi Wo Programme”, and the “Management Agreement Scheme at Lai Chi Wo”. In addition, the Hong Kong UNESCO Global Geopark “Ap Chau Story Room” was opened on April 8, 2018. These are a few successful examples of innovation and cooperation. To deepen the understanding of the Recommended Geopark Guides and R2G operators of the Geopark tourist spots in Lai Chi Wo and Ap Chau, the Geopark Division of the Agriculture, Fisheries and Conservation Department invited the Ap Chau Community and the Policy for Sustainability Lab of the Faculty of Social Sciences of the University of Hong Kong to jointly organise a field visit. The event attracted more than 30 R2Gs and representatives of R2G operators, who benefited from the exchange of ideas and discussions with various related organizations and stakeholders. 13 new members of the UNESCO Global Geoparks Network were announced by the Global Geoparks Network. These new members bring the total number of Global Geoparks to 140, throughout 38 countries. 37 of them are located in China. Three new definitive stamps in denominations of $2.60, $3.40 and $4.90 with associated philatelic products will be released for sale on 1 January 2018 (Monday). The designs of the new stamps are in line with those of the definitive stamps issued in 2014, based on the distinctive landforms and landscapes of the Hong Kong UNESCO Global Geopark. The first Hong Kong UNESCO Global Geopark Tourism Magazine is available now! To publicize the unique and diversified experiences Hong Kong UNESCO Global Geopark (Hong Kong Geopark) offers and to bring you the best of Hong Kong Geopark in geological, ecological, cultural and historical terms, a local media group has been commissioned to produce and distribute a geo-tourism magazine starting from June 2017. Read the flip-book now in Hong Kong Geopark’s website. The new geo-tourism magazine covers Hong Kong Geopark’s top sights, photo spots and must see attractions, local community activities and local products, geo-tour packages, guide maps, transportation and geopark-themed accommodation, which we and the geopark communities jointly suggested. Do check it out before exploring Hong Kong Geopark and its spectacular natural and cultural heritage! Following the first interpretation training course in 2015, Hong Kong UNESCO Global Geopark invited Ms. Brenda Chan, an experienced practitioner in both the tourism industry and stage performance, to give a refresher training workshop on communication and presentation skills for Recommended Geopark Guides (R2G) on 28 April 2017. At the workshop, Ms Chan highlighted a number of techniques for providing guide service and showed R2Gs how to prepare tour commentaries with a unique personal style. In group discussions and practical exercises, the R2Gs in different groups took turns presenting various geological phenomena in their own ways and shared their insights with great enthusiasm. Exchanging actively with the instructor and other R2Gs, they also explored interesting and creative interpretation approaches to make geological phenomena easier to understand. By offering high quality training opportunities to R2Gs and the geopark community, Hong Kong UNESCO Global Geopark aims to engage the local people in stimulating socio-economic development through the promotion of sustainable geo-tourism. The Hong Kong UNESCO Global Geopark of China Annual Report 2016, which summarized our major activities in 2016, has been released. During the reporting period, Hong Kong Geopark continued to adopt a flexible approach in supporting and promoting conservation and sustainable development through harnessing the effort of the community which contribute towards improving the livelihood of the rural community and the conservation of natural and traditional value. As an active member of the Global Geoparks Network, China Geoparks Network and Asia Pacific Geoparks Network, we are committed to serving as an intellectual hub for all three networks. Hong Kong Geopark continued our active participation in the regional and global geopark movements in 2016. At the same time, We are committed to improve our services and cater for the growing needs of visitors. Noting that Climate Change was recently listed as one of the Top 10 Focus Areas of UNESCO Global Geopark, Hong Kong UNESCO Global Geopark (HKUGG) is collaborating with our new partner, the Jockey Club Museum of Climate Change (MoCC), to organize a training workshop for our Recommended Geopark Guides (R2Gs) and MoCC staff from March to April 2017. Workshop participants will have a chance to share knowledge on climate change, and visit the MoCC, green facilities in a local university and geological sites in HKUGG. This training workshop will provide us with an opportunity to show both our R2Gs and MoCC staff how a UNESCO Global Geopark can serve as outdoor earth science museum and engage them in disseminating geo-conservation messages and raising public awareness about climate change. In its 27th meeting on 6 November 2016, the Global Geoparks Network (GGN) Executive Board decided to become a partner in the International Year of Sustainable Tourism for Development, 2017 (IYST 2017). The main aims of the partnership are (1) to promote UNESCO Global Geoparks (UGGs) as sustainable tourism destinations in the international tourism market, (2) to promote Geoparks collectively and build new links with the tourism industry, and (3) to raise the profile and visibility of UNESCO Global Geoparks. Hong Kong UNESCO Global Geopark, along with other UGGs, will participate in a series of promotional activities under IYST 2017. The United Nations (UN) has declared 2017 the IYST to recognize the importance of international tourism in fostering better understanding among nationalities and cultures worldwide, thus leading to greater awareness of the rich heritage of the various civilizations, greater appreciation of the inherent value of different cultures, and greater opportunities for peace in the world. The World Tourism Organization is invited to facilitate the organization and implementation of IYST 2017, in collaboration with other relevant parties, including the GGN. IYST 2017 aims to raise awareness of the contribution of sustainable tourism to development among decision-makers and the public, while mobilizing all stakeholders to work together to make tourism a catalyst for positive change. The Hong Kong UNESCO Global Geopark of China Annual Report 2015, which summarized our major activities in 2015, has been released. During the reporting period, Hong Kong Geopark continued to adopt a flexible approach in supporting and promoting conservation and sustainable development through harnessing the effort of the community which contribute towards improving the livelihood of the rural community and the conservation of natural and traditional value. As an active member of the Global Geoparks Network (GGN), China Geoparks Network and Asia Pacific Geoparks Network, we are committed to serving as an intellectual hub for all three networks. Hong Kong Geopark continued their active participation in the regional and global geopark movements in 2015. At the same time, they are committed to improve the services and cater for the growing needs of visitors. The forth Asia-Pacific Geoparks Network Symposium was held in San’in Kaigan Global Geopark in Japan from 15-20 September 2015. During the conference, 9 new members of the Global Geoparks Network were announced. These new members bring the total number of Global Geoparks to 120, throughout 33 countries. 33 of them are located in China. To raise public awareness and interest in local biodiversity, the Environment Bureau, the Agriculture, Fisheries and Conservation Department (AFCD), local universities, non-governmental organisations (NGOs) and green groups jointly organise the first ‘Hong Kong Biodiversity Festival 2015 – Cherish Nature’ (HKBF 2015). Running for three months, the HKBF 2015 offers over 120 programmes and activities in four main categories, namely Special Activity Series, Exhibition and Seminar Series, Workshop and Nature Tour Series as well as Competition and Volunteering Programme Series, that are suitable for families and individuals. For details of the festival, please visit the website of HKBF (www.afcd.gov.hk/hkbf) and Facebook page (https://www.facebook.com/pages/Hong-Kong-Biodiversity-Festival/1217773964915529). Hong Kong Global Geopark recently invited Dr. Stephen Cheung to give a talk on local Hakka culture and Hakka dialect for 20 Recommended Geopark Guides (R2Gs). Dr Cheung’s academic specialty is Musicology and Cultural Studies, and he is the acting head of the Graduate Education Centre at the Hong Kong Academy for Performing Arts. He discussed with R2Gs the topics of local Hakka cuisine, houses and festivals. He also shared his experiences as a Hakkanese and his research on traditional Hakka songs. This talk widened the R2Gs’ understanding of the origins of the Hong Kong’s Hakka people, their migration history and the development of their unique culture. Hong Kong Global Geopark also distributed polo shirts and interpretation boards, which were sponsored by the Lion Nature Education Foundation, to the R2Gs. The polo shirt is made of a dry-fit fabric, which is ideal for Hong Kong’s hot, humid summers. The interpretation board is equipped with a map of Hong Kong Global Geopark with location details of the geo-trails and geo-heritage centres. It is intended to facilitate R2Gs’ introduction of geosites and related facilities to visitors. A new round of Recommended Geopark Guides (R2G) interview will be held on 23 September 2015 (Wednesday); for those who are interested to the scheme and eligible persons please apply before the deadline of 3 August 2015. If the number of applications is enormous, Secretariat will draw lot to select candidates for interview. Those who are not selected for interview will be regarded as the applicants for the next round of application and they do not have to re-submit their application. To enhance the standard of geopark guide services, Hong Kong Global Geopark invited Ms. Brenda Chan, an experienced practitioner in both the tourism industry and stage performance, to give a training workshop on communication and presentation skills for 30 Recommended Geopark Guides (R2G). The workshop covered presentation skills and problem-solving techniques, and included a group discussion and presentation session to allow the R2Gs to learn through sharing and peer review. In his opening remarks at the workshop, Dr K.M. Yeung, head of Hong Kong Global Geopark, shared with the R2Gs the latest geopark developments and the global geopark revalidation preparation work. He encouraged the R2Gs to continue their good work in advancing their knowledge and skills, including obtaining a tour guide certificate, to get better prepared for increasing demand from the international market. The sixth Global Geoparks Conference was held in Stonehammer Global Geopark in Canada from 19-22 September 2014. During the conference, 11 new members of the Global Geoparks Network were announced. These new members bring the total number of Global Geoparks to 111, throughout 32 countries. 31 of them are located in China. The opening ceremony of Hong Kong Global Geopark Volcano Discovery Centre (the Centre) will be held on 15 July 2014 and the Centre will be ready for public visit for free on the next day. Conveniently located at Sai Kung Waterfront Park, the Centre is accessible by a wide range of public transport. It is an ideal point for embarking on an exploration in the Hong Kong Geopark. The 1,000-square-foot centre showcases a 1:1 scale hexagonal exhibit to show the size of the rock formations. A range of rock specimens, with some collected locally and many others from other places around the world, are also on display. Visitors to the Centre can take a peek at the huge columns before they depart for visiting the marvelous Geopark. By observing the exhibits, they would also be able to better understand the geological background and uniqueness of Hong Kong’s hexagonal columns. Hexagonal rock columns, which are a major feature of the Geopark, were produced by a series of violent volcanic eruptions in Sai Kung 140 million years ago. Hongkong Post will issue 2014 Hong Kong Definitive Stamps on 24 July 2014. In order to enhance public’s interest of Hong Kong Global Geopark of China, and also to promote the new definitive stamps, Agriculture, Fisheries and Conservation Department and Hongkong Post jointly organise an internet voting event, namely “My Favourite Geosite in Hong Kong”. Voting period starts from 18.6.2014 until 17.7.2014. The result will be announced on the issuing day of new Definitive Stamps i.e. 24.7.2014. As a token of thanks, each voter will get a Serviced First Day Cover for Free. Act now and visit the web page below to vote your favourite geosite in Hong Kong! Geopark Guides (R2Gs), they are required to be reassessed once every two years. The first biennial reassessment interview was successfully held on 7 December 2013 where Dr. KM Yeung from Hong Kong Global Geopark, Dr. Young Ng from Association for Geoconservation, Hong Kong and Dr. Masahiro Aoki from Geological Survey of Japan commended the work of R2Gs and shared their views and experience with the group. A total of 32 candidates are due for the reassessment. The results, which are based on their experience in guiding tours, hours of continuous education and their performance in the interview, will be released by the end of 2013. The first "Asian Pacific Geotourism Conference 2013" organized by the Association for Geoconservation, Hong Kong, Hong Kong Global Geopark of China and Committee of Tourism Earthscience and Geopark of Geological Society of China will be held at Hong Kong Convention and Exhibition Centre on 30 November 2013. For enquiries, please contact the Asian Pacific Geotourism Conference Secretariat at apgc2013@rocks.org.hk. The third Asia-Pacific Geoparks Network Jeju Symposium was held in Jeju Global Geopark in Korea from 7-13 September 2013. During the conference, 10 new members of the Global Geoparks Networks were announced. These new members bring the total number of Global Geoparks to 100, throughout 29 countries. 29 of them are located in China. A new round of Recommended Geopark Guides (R2G) interview will be held on 27 May 2013 (Monday); for those who are interested to the scheme and eligible persons please apply before the deadline of 26 April 2013. If the number of applications is enormous, Secretariat will draw lot to select candidates for interview. Those who are not selected for interview will be regarded as the applicants for the next round of application and they do not have to re-submit their application. The 12th European Geoparks Conference will be held at Cilento and Vallo di Diano Geopark, Italy, from 4-6 September 2013. 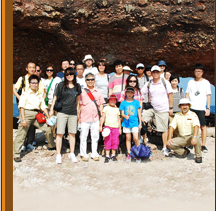 The 3rd Asia-Pacific Geopark Jeju Symposium will be held in Jeju Island Global Geopark, Korea from 9 – 11 September, 2013. The simulated practical session for the first qualifying examination for Accredited Geopark Guides (A2G) was completed on 5 and 6 March. After having interviewed the participants, the assessment panel would like to take this opportunity to suggest a list of recommendations for all geopark guides to enhance their future guide work. Keep smiling. Present a cheerful, positive image in order to provide a pleasant travel experience for your tour group. Help your tour group to explore geological knowledge, but avoid giving information in the style of classroom teaching. While we do not encourage too much technical interpretation during the guided tour, make sure you have a thorough understanding of geological concepts. Otherwise, it would be impossible to interpret the relevant knowledge in layman’s language. No matter how familiar you are with a particular geosite, always set simple, concise objectives and decide the key message you wish to impart before beginning your guided tour. Analyse your group makeup to be sure you avoid using terms or language which may be unclear, confusing or offensive to them. Support the geo-conservation message appropriately with relevant scientific knowledge. Make sure the scientific information you present is clear, concise and accurate. Do not mention uncertain scientific information. Avoid using technical terms. For example, consider using “cracks” instead of “joints”. Do not spend all your time talking. Your group will be much more likely to remember the information if they are given time to digest it. When you use question-and-answer format to explain things, avoid asking difficult questions because they may embarrass the visitors and lead to a sense of frustration. Do not include too many key messages in a short interpretation or the visitors may not be able to digest the contents. Work on strengthening your speaking and presentation skills. For example, focus on the main points when explaining a geological phenomenon. Avoid mentioning the fine details or points which are not directly related to the phenomenon. This helps to highlight the theme and makes it easier for your audience to remember your main points. Highlight the uniqueness of the geological phenomenon or attraction to arouse the interest of the audience before explaining the details. Focus your interpretation on the immediate scene. Mentioning too many things which the audience cannot actually see will limit their understanding. The interviews for the 4th batch of the Recommended Geopark Guide (R2G) applications were held on 27th and 28th February. There were a total of 47 applications, from which 26 eligible candidates were interviewed. Ten candidates, or 38 per cent, passed the assessment, becoming provisional R2Gs. Individual candidates will soon be notified of the assessment results by email. 1 As representatives of Hong Kong Global Geopark of China, R2Gs must present a cheerful and positive image in order to provide a pleasant travel experience for visitors. 2 The candidates generally had a good understanding of geo-conservation. However, they should deepen their understanding of the significance of geoparks in science popularization. While unnecessary technical terms should be avoided, the accuracy of the scientific information must not be compromised in the guided tours. 3 The assessment panel encourages the use of creative interpretation skills. However, the continuity of the entire interpretation should be taken into account to ensure the message does not become fragmented. 4 One of the important requirements of R2Gs is the ability to conduct geotours in a language other than Cantonese (e.g. Putonghua and English). In addition to proficiency in the language, they must pay particular attention to the proper pronunciation of technical terms. This is important to help visitors understand the relevant geological knowledge. 5 The panel found that the candidates generally tended to overtalk during the interpretation and did not give their audience sufficient opportunity to digest the information. It is recommended that the guides should set a simple and concise objective before beginning their interpretation. 6 There are often different views and explanations for various geological attractions and ecological information, but the panel recommends that the candidates understand and verify the information first. Hearsay should never be used in guided tours. Interviews for new recruits of Recommended Geopark Guide are scheduled on 27, 28 February. Secretariat has reached the candidates individually. You may direct any enquiry to the email address secretarial@hkr2g.net for further information. We receive a good news from Norway that the application to enlist to Global Geopark Network by Hong Kong Geopark has been approved. We would like to celebrate the honour and joy with the new title Hong Kong Global Geopark of China to all of you. Secretariat would accept applications to become R2Gs now. The details of application and interview schedule will be published here soon. If the number of applications is enormous, Secretariat will draw lot to select candidates for interview. Those who are not selected for interview will be regarded as the applicants for the next round of application and they do not have to re-submit their application. The result of provisional R2Gs passing probation is summarized. Public Seminars on Geoheritage and Ecology" were successfully conducted at Hong Kong Space Museum and speakers shared their experience to enhance the public understanding on the geological features, local participation and marine ecology in Hong Kong National Geopark. The Northeast Sedimentay Rock Region boat tours by R2Gs of Hong Kong National Geopark are ended happily and successfully. The 3rd round interview of Recommended Geopark Guide was conducted on 1.11.2010. Result will be announced to individual applicant later.